It is doubtful that the buyout of the Hiland MLP (HLND and HPGP) by billionaire Harold Hamm will get sufficient votes at Tuesday's shareholder meeting. This is already the second meeting after the Otober 20 meeting was adjourned when only 43% of the publicly held shares voted in favor. Both Hiland companies have significant upside if the deal falls through. In our recent Hiland posting (here) we speculated that oil magnate Harold Hamm, the acquirer, would not obtain sufficient votes at the October 20 shareholder meeting to close the transaction. We think the only way to get shareholder to buy into the deal is to follow the recent example of Black Stone Minerals bid for Eagle Rock Energy's (EROC) minerals business and increase the price. Hamm should look closely at the bidding war that is unfolding at Eagle Rock (EROC) over its minerals business. It began on September 18 when Natural Gas Partners (NGP), which controls the general partner of Eagle Rock, proposed to acquire the minerals business for $135 million. While EROC was evaluating the proposal, NGP raised its bid to $145 million on October 13. Less than a week later Black Stone Minerals Company joined the bidding with a $157.5 million bid. Both proposals include support for an equity raise. As we pointed out in our last post about Hiland, natural gas trades higher now than when the original buyouts at $9.50 (for HLND) and $3.20 (for HPGP) were announced. Nevertheless, Hamm sticks to prices that value the firm at a level when natural gas was some 30% lower. We believe that the strong performance of natural gas is the principal driver of the pending bidding war at Eagle Rock, and we do not see why Hiland should be stuck at a gas price from a different economic environment. The trick is the interaction between the shareholder meetings at HLND and HPGP. Both buyouts must be approved by the public shareholders (other than Harold Hamm) before the transaction can close. At the last meeting only 43% of the public shareholders supported the transaction. Since the adjournment of the meeting to allow Hamm to solicit more votes HLND has moved above the $7.75 acquisition price. This indicates clearly that the market believes that the deal will not get done at $7.75. HPGP still trades at a small discount to the $2.40 acquisition price. Hamm will increase the price of the merger. We think that a price that is closer to the initial January 15 bid of $9.50 for HLND and $3.20 for HPGP could sway sufficient shareholders to vote in favor. In our opinion this is the most likely scenario. If the deal collapses then HLND and HPGP would probably trade above the acquisition price in light of the dramatic improvement of the gas price over the last two months. Gas has more than doubled from its September lows, trades about 40% higher than when Hamm lowered his acquisition price to the current levels, and is 10% higher than it was when Hamm lowered the price. As a result, HLND and HPGP should restore their profitability. One concern that triggered the acquisition was Hamm's support of the company in light of its covenant violations. We believe that Hamm, as a 50% shareholder, has more to lose than anyone else if Hiland suffers as a result of covenant violations. He should be willing to provide support even if he were to withdraw his acquisition proposal. We think the first scenario is the most likely one. 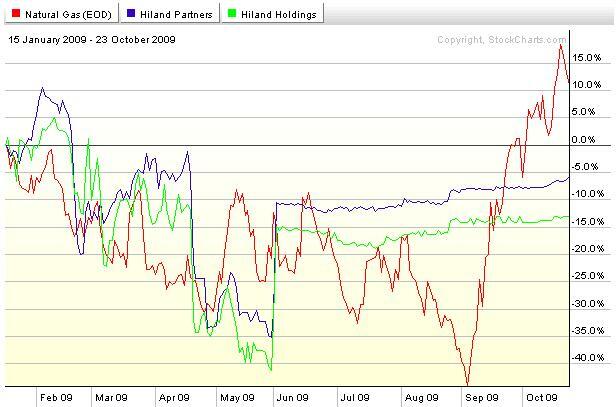 Hiland's shares are held widely by retail investors who typically do not vote. They are even less likely to vote if they get a bad deal such as this buyout, which is priced at roughly two years worth of dividend payments (prior to their suspension). Some shareholders who initially voted for the deal might try to change their vote to a “no” when they see the shares trading above the deal level. Such changes in votes would offset any additional “yes” votes that the proxy solicitors collect. Changing the vote is not easy, though: most shareholders hold their shares through a brokerage account and vote at proxyvote.com or via telephone at the 800 number that comes with the voting materials. However, when we did a test the other day the control number no longer worked, so that shareholders can not change their vote in the normal way. The trick to work around this issue may not be known to many shareholders: rather than using the materials the company sent out, the shareholders must call the proxy solicitor D. F. King (1-800-967-4612). However, this also means that the only "yes" votes that can come in at this point are those that are collected by the proxy solicitor. On balance, the chances for a "yes" vote on Tuesday are not high. Whether or not the transaction goes through, we believe the risk/return profile of the two Hiland companies is attractive. The market prices the probability of an upside into HLND at Friday's 5 cent premium to Hamm's acquisition price. We think that probability is much higher than that premium suggests.